All CDbaby transactions are safe & secure, and conducted using the #1 trusted name in online purchasing, PayPal. #ToastToTheDeadTuesday 04-10-2018 : This week we remember George Carlin, a writer who performed his own material.George Carlin said that he wants his epitaph to read "Geez, he was just here a minute ago." So, there ya go.There's too much that could be said about George & his influence in my life. His work was funny, enjoyable, irresistible and highly informative. His comedy & interviews made me question a lot of things and want to know more about how the world works. Besides being funny & smart, Carlin didn't pull punches or soften his words even stating during a stand up "...and I know what you're thinking - you're saying 'Jesus, he's not going to attack the children is he?' ... Yes he is!" declaring "...remember, this is Mr. Conductor talking - I know what I'm talking about. "I can't think about George Carlin without thinking about 'An Incomplete List of Impolite Words'. 2,443 "filthy" words and phrases compiled by George Carlin and immortalized on a poster that hung right above my pisser for 9-10 years I think. That means every time I took a piss, I did so while studying this list - often spontaneously laughing out loud like Alexa. (...but not in a 'creepy CIA is listening & Skynet in our home' kinda way...) Not that I would ever need it for job interviews, dates, general social conversation or even to put them in a verse, I just found it funny to imagine him using pieces of this. Click HERE to order (from GC's official website) the poster that outlasted all the rest & probably my all time favorite of any wall decoration I've ever had. I never got to meet him or talk to him, but I was fortunate enough to see his show live in Washington DC once. This was back around when 'Life Is Worth Losing' was released on HBO and audio format. I had both, of course. A VHS dubbed copy of the live HBO broadcast, and the CD from Best Buy. I was definitely a collector of his work and I found myself listening to his stuff as often as I could. I regularly kept his CD in the car, the MP3 on my computer at home & at work, and sometimes even one of his books wherever I traveled. He, like other artists & content creators I've admired in my life, was a topic of study for me. I wanted to know how Carlin got where he got & what he went through to get it - hoping to find use of what I learned.Every once in a while I would be in a room with another human being who was fluent in Carlinguistics the way I was. 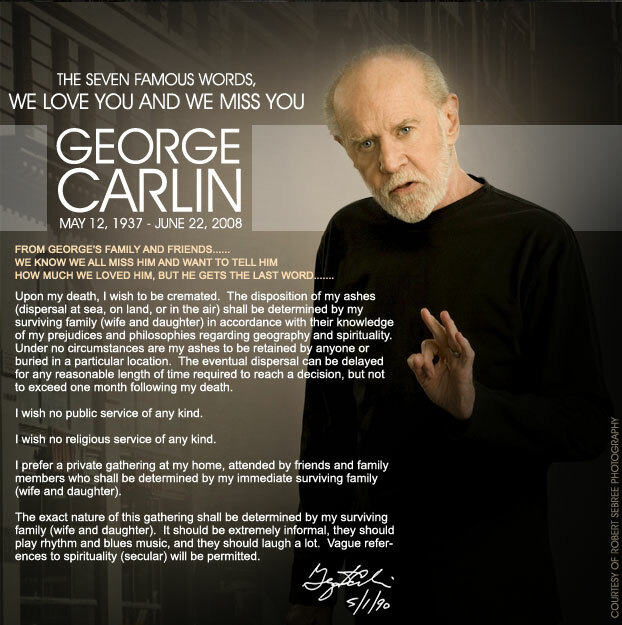 Needless to say we'd have a good time going back & forth with some classic Carlin and I would always appreciate the fact that another mind appreciated his mind the way my mind did.It was sad, but not that sad - because we knew how he felt about it - when George Carlin died. He was born May 12, 1937 and died June 22, 2008 at the age of 71. He was funny as ever in his final stand-up 'It's Bad For Ya' and spent his life doing what he loved for the reasons he felt were important. Although he wasn't optimistic about the outcome of humanity with regard to causing our own extinction through war & pollution of the environment, he did his part to give people back their brains that were taken from them and pumped full of crap at home, in schools and in churches with harsh truths in the form of well executed punch-lines. I featured some of his words in my joint 'Mad Scientist Flow' on 'Back-II-School', and his thoughts & experiences reflect in my work and in my life often. Here's to George, we toast you brother. It was great to see you live in DC at least once. Here's a pretty dense compilation of his thoughts & works for you to save for a rainy day.